Artificial Intelligence is doing something that once seemed unthinkable. It has already made a global impact with the creation of conversational chatbots, self-driving cars, and recommendation systems. It is growing among businesses, and is found in multiple industries, transforming the way businesses and societies operate. Healthcare, Finance, Education, and Transportation are some industries which are redefining efficiency using AI. Professionals are opting for Artificial Intelligence Training programs to become part of the future. Ai is helping doctors to make faster and more reliable diagnoses. AI applications can be seen in the areas of imaging and diagnostics, and oncology. Algorithms take information from electronic health records, prescriptions, and insurance records to design a personalized treatment plan for patients. Similarly, it is disrupting finance industry as well. Due to the speed of technological development, transformative change is expected to come much sooner than expected. Big data, Blockchain, and Smart contracts are undoubtedly transforming AI to unprecedented levels. The breakthrough of “Internet of Things” applications, enormous increase in computational power, and development of smart machines are expected to facilitate AI’s development and global adoption. Algorithmically based companies like Apple, Google, Microsoft, and Amazon are embracing AI to assist their users with more and more difficult tasks. According to experts, it is just the beginning of a revolution that will transform everyday life and how we interact with technology. Customers trust companies that embrace new technologies and bring them to the market. Artificial Intelligence is the most important business opportunity for the future. Learning AI is a great way to secure your future by staying updated. It is still in the development stage but issues surrounding this new technology will soon be solved. In the last few years, careers in artificial intelligence (AI) have grown exponentially to meet the demands of digitally transformed industries. Though there are plenty of jobs, there’s a significant shortage of talented professionals with the necessary skills. 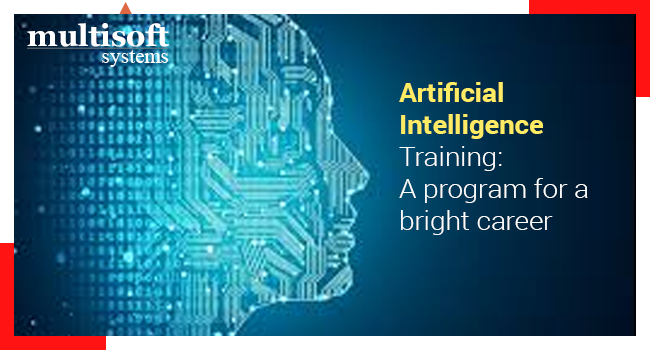 If you want to transition into a career as an AI professional, check out Multisoft Systems’ Artificial Intelligence Training in Noida. They enlist only certified trainers who own extensive experience in their respective fields. Their Artificial Intelligence (AI) and Deep Learning Advance Training program is ideal for anyone who is interested in Artificial Intelligence, Machine Learning or Deep Learning.